We bought this place in 1975 and have since then made restorations of the thatched main house and the mill house. While all the time bringing the house up to the best of modern standards for living, we have ensured that our choices of materials and methods of restoration have continuously been in accordance with the original style and atmosphere of the buildings which are classified as “worthy of preservation”. The entire property is encircled by gardens, and the big trees, roses, bux hedges, little paths and rockeries create a lovely frame for enjoyment and relaxation. 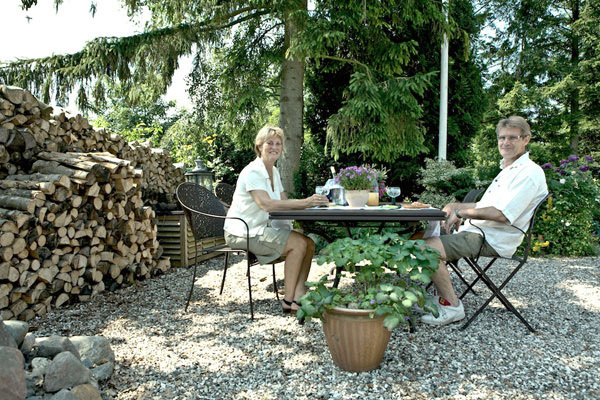 Our beautiful house and garden have always been a natural centre for gatherings of friends and family. Throughout the years we had a growing wish to share the joy of this place with many more people – and with the realization of BB Hotel Albertine we can now share some of those delights with our B&B guests. The village of Tune is a so called “star-village”, in which the centre was always “forten” – a sort of common for the animals to graze on. The farms had their houses and their land stretching from this “forten”. Our main house is dated back to app.1780 and it used to be part of a farm with four wings. The name is Gl. Rugbjerggaard, and with its somewhat elevated position it offers a fine view to the church. For many years it enjoyed the status of a corn mill. When we, Mai and Claus Olesen, bought the place, we found a solid iron construction of the mill still built into the wing where the corn had been kept and milled. This building is dated back to app. 1890, and today it houses BB Hotel Albertine.